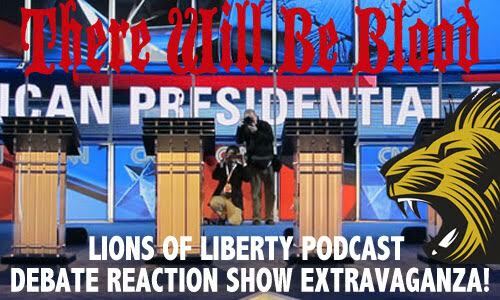 Lions of Liberty GOP Debate Reaction Show! Join us as the Lions of Liberty convene a cast and crew of assorted libertarians in living rooms drinking liquor to react to the very first Republican Primary Debate of the 2016 election cycle. Marc is joined by Brian McWilliams, John Odermatt, JB Lubin and Howie Snowdon to break down how each and every candidate performed in this kickoff to the mainstream election cycle. They discuss how Donald Trump is shaking up the race and the impact of his presence, the exchange between Rand Paul and Chris Christie over NSA spying, and toss out puns galore! Grab your favorite adult beverage, kick back and join us for this entertaining look at the GOP circus.